Zoho Books can be integrated with different apps and payment gateways. Let us see how this is done. Click the Gear Icon on the top right corner of the page. Now choose Online Payments. You’ll find the list of payment gateways that Zoho Books supports. Click on a payment gateway to find out how you can use it along with Zoho Books. 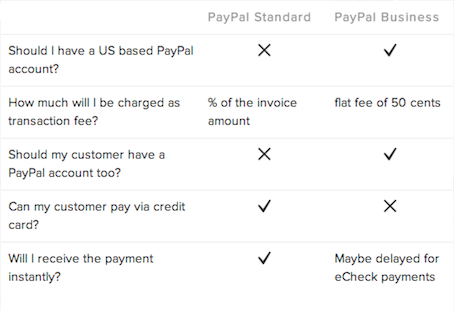 To setup PayPal as your preferred gateway for receiving payments: * Click on the Gear Icon on the top right hand side corner of the page. * Go to Integrations and select Online Payments. 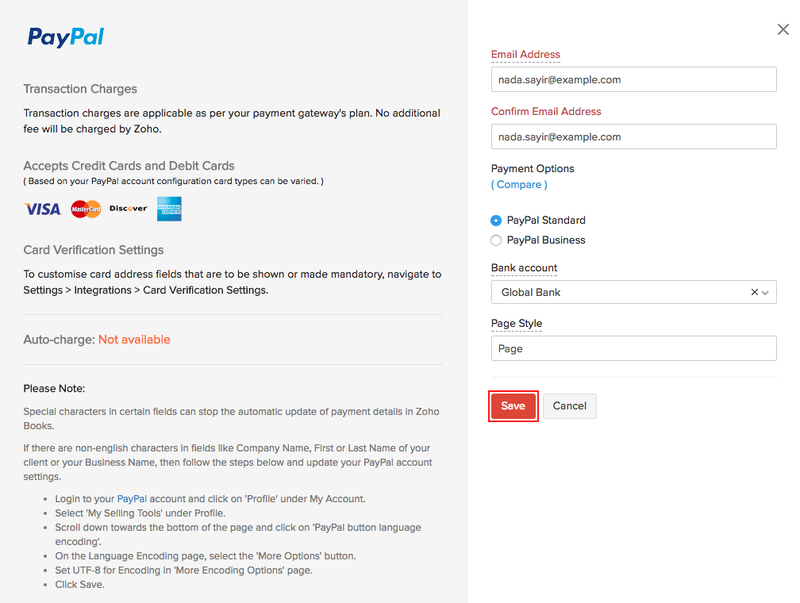 * Click the Setup Now button next to the “Paypal” logo. * Enter the following information and click Save. To configure Authorize.Net, click on the Gear icon on the top right hand side corner of the screen. 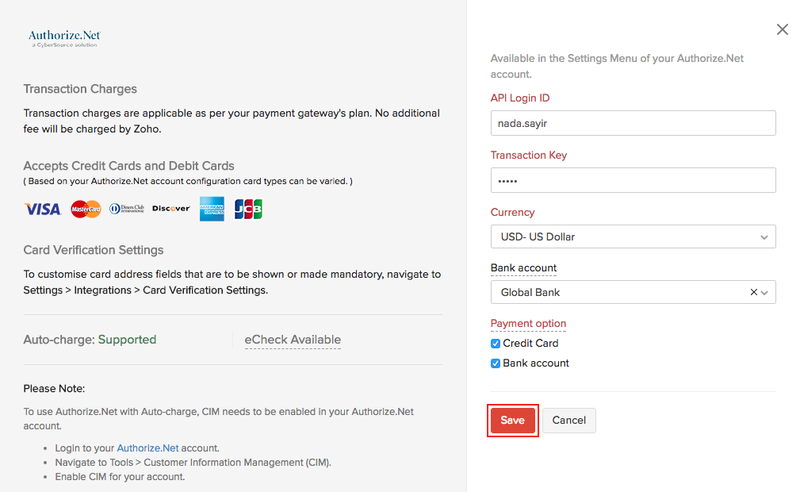 Go to Integrations and select Online Payments and click the Setup Now button adjacent to Authorize.Net logo. Enter the following information and click Save. API Login ID: Enter the API Login ID given to you by Authorize.Net. Currency: Enter the currency of receipt. Currently Authorize.Net supports transactions only in US Dollars (USD), Canadian Dollars (CAD), Euro (EUR), Pound Sterling (GBP). Tip - Countries supported by Payflow Pro: United States, Canada, Australia, and New Zealand. 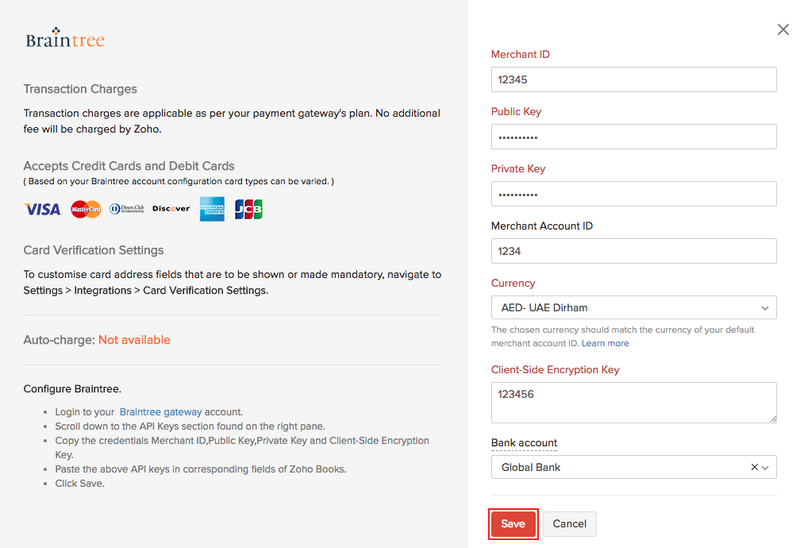 To set up Stripe as your Payment Gateway, click on the gear icon on the top right hand side corner of the screen. Go to Integrations and select Online Payments. Here you will find Stripe as an option. Click on Connect to Stripe to configure stripe for your Zoho Books account. Click Here, to learn more about Stripe integration with Zoho Books. To configure 2Checkout, click on the gear icon on the top right hand side corner of the screen. 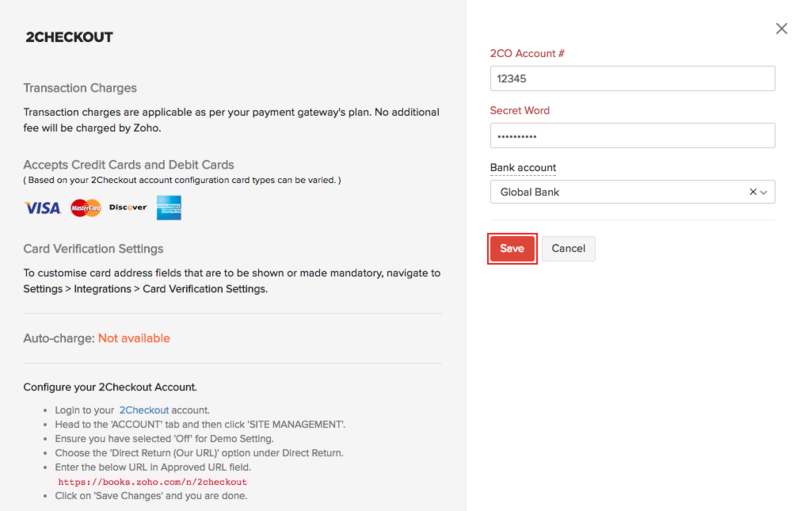 Go to Integrations and select Online Payments and click the Setup Now button adjacent to 2Checkout logo. Enter the following information and click Save. 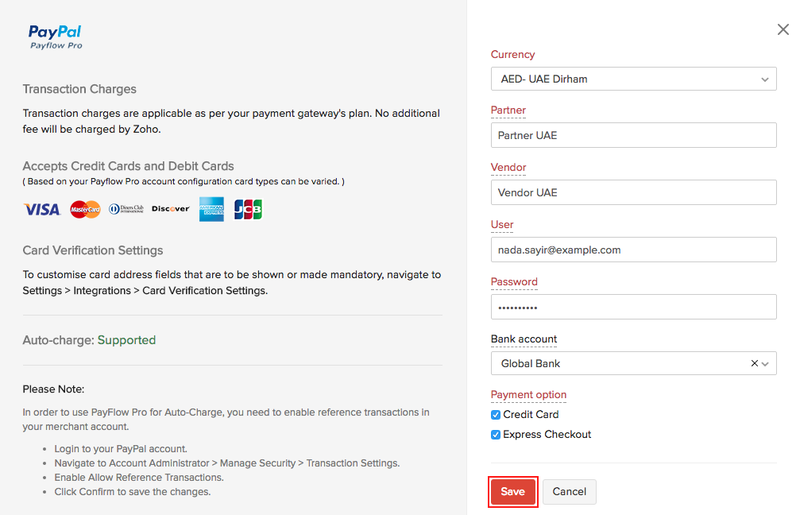 Zoho Books offers ACH payments via Authorize.Net, a payment gateway that specializes in ACH payments.ACH is a secure payment transfer system that connects all US financial institutions. This facility will allow you to debit payments directly from a customer’s authorized bank account. You must be a US based merchant. 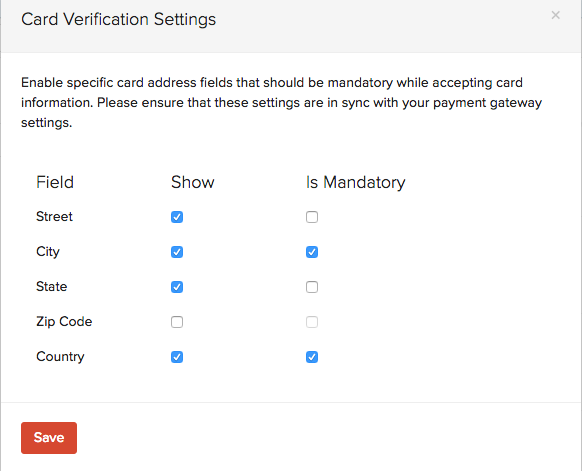 You need a payment gateway that supports ACH payment. 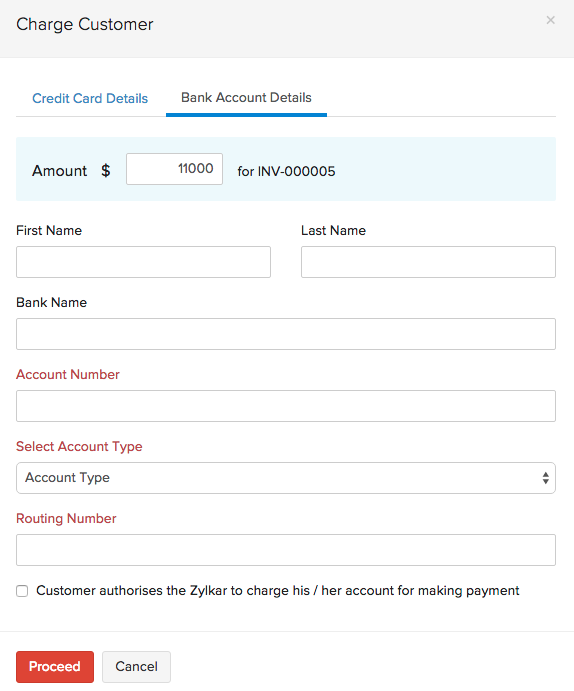 In order for customers to make ACH payments, you need to enable Allow this customer to pay via his/her bank account option for your customers under Contacts edit section. To use ACH facility, you will need to setup Authorize.Net or Forte as the default payment gateway on Zoho Books. Go to the Invoices tab. 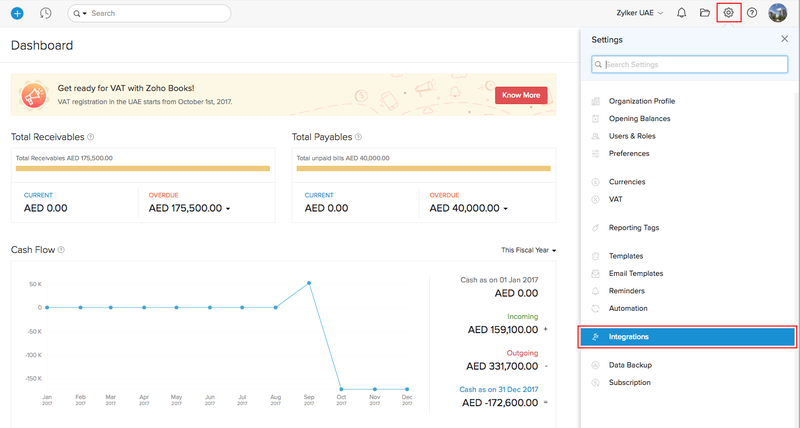 Select the invoice for which a payment needs to be recorded. Click on the Record Payment drop-down and select Charge Customer. A Charge Customer screen will open up. You will be asked to enter either Credit Card Details or Bank Account Details. In this case, select the tab Bank Account Details and enter the customer’s bank account details. 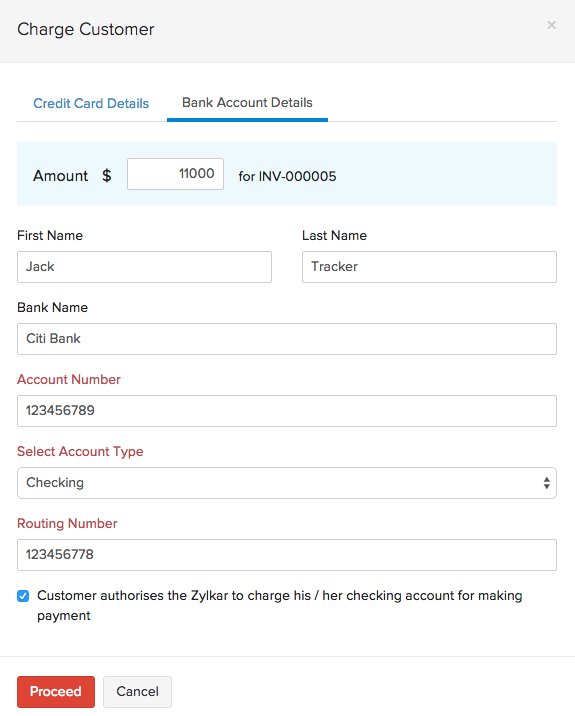 Account number, Account type and Routing number are mandatory fields to configure the bank account. Select the check-box against Customer authorises “Org Name” to charge his / her checking account for making payment and click on Proceed. 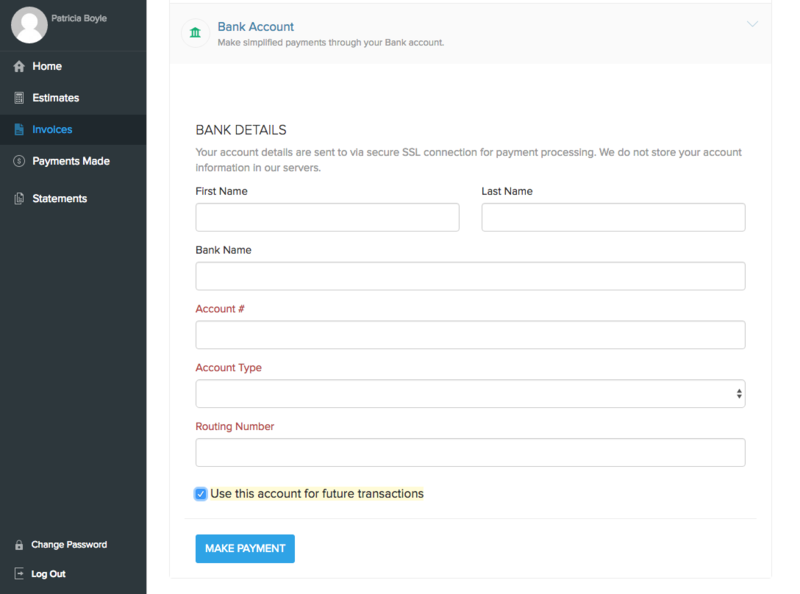 Making payments through Client Portal. Note: Customers can also choose to save their account details for future transactions by checking the Use this account for future transactions option. Zoho Books allows you to configure the number of retries necessary in case of a transaction failure. The various configurations available are shown below.